ASUS labels the N series notebooks as multimedia-centric, but we have to disagree on that one. Since the last upgrade, the N551 has become so powerful to a point where you can’t really tell the difference between the N551VW and its ROG counterparts, like the GL552VW or G551. So we can easily classify it as premium multimedia offering or a mid-range gaming laptop. We’ve got Intel Core i7-6700HQ on board, paired with 8GB of DDR4 RAM and NVIDIA GeForce GTX 960M GPU. All of this can handle some more serious gaming and cost a little under €1 000, just like the GL552VW. Even so, the N551VW lacks some features that the GL552 offers, but excels in others like design and build quality. We expect it to offer relatively the same user experience as the old N551 but will differ from the new N552. Our mission is to find out more about this model and then adequately compare it to the new N552. This way we will know for sure if the extra bucks for the N552 are worth it, assuming the price of the N552 will be higher than its predecessor, of course. As a multimedia-centric notebook, the most interesting accessory here is the external subwoofer by Sonic Master. It enhances the multimedia experience even further. You will also find the usual user manuals, AC charger and cable, and the notebook itself. We are familiar with the build quality and presented design language, so we will try to be brief about this. The bottom line, however, is that we are more than satisfied with the choice of materials and overall looks. It’s sturdy, elegant, sleek, but it’s a bit on the heavy side. Also, it’s kind of bulky as well. 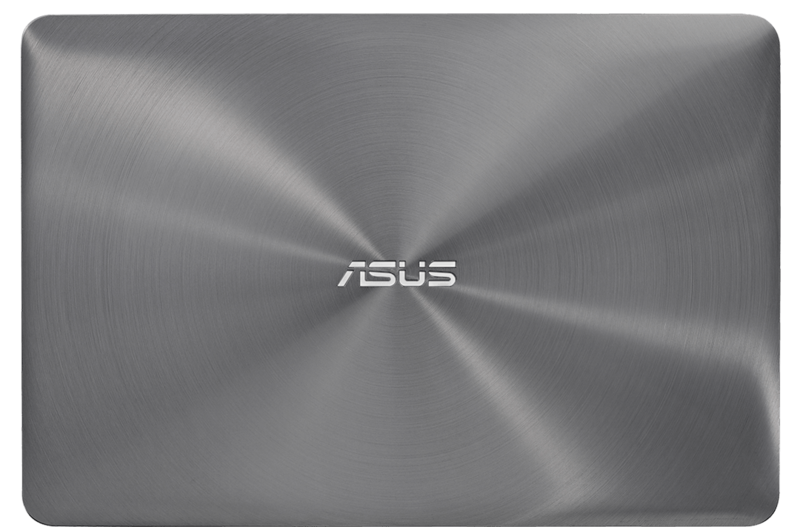 The lid features ASUS’ LED backlit logo at the center of the concentric, brushed aluminum finish we are used to seeing at with the N series. It adds to the rigidity and a bigger force has to be applied in order to bend. It still seems a bit thick – as thick as some touch-enabled screens are. The hinges feel stable, but feel a bit overly tightened because both hands are needed to open the notebook. We still prefer the stability in this situation, though. The bottom piece of the notebook isn’t part of the whole design language and stands out with its black color and rugged, hard texture. You can see the extra grill that can aid with the airflow from an external cooling pad. There’s also a service cover granting access to the usual upgrade options – 2.5-inch HDD/SSD slot, RAM chips, and WLAN module. As for the sides of the machine, they are 32.2 mm thick and that’s a bit too much. 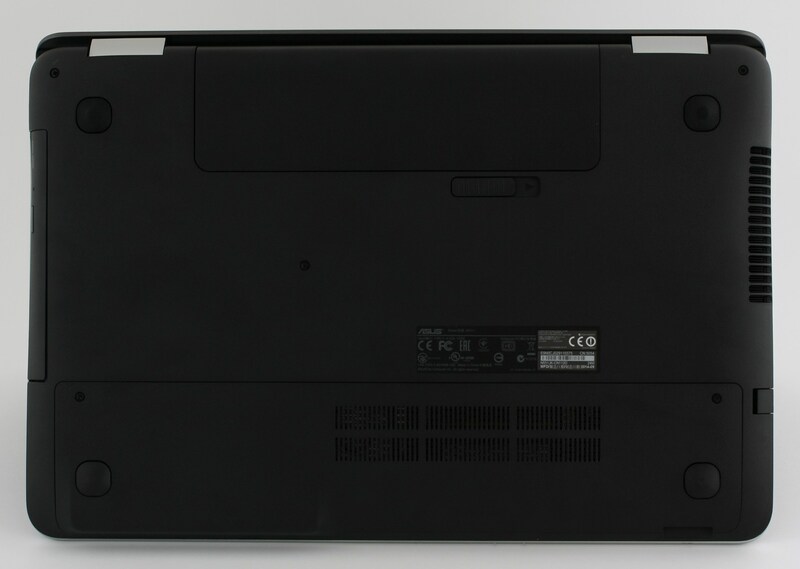 The weight also seems a bit off – 2.7 kg, which is a digit mostly suitable for 17-inch budget notebooks. Anyway, the left side accommodates the main heat dispersing grill, DC charging port, mini DisplayPort, LAN, HDMI and two USB 3.0 ports, while the right side remains mostly free with only the optical drive, 3.5 mm audio jack and USB 2.0 port sticking out. The profile of the notebook consists of the two main plastic parts meeting halfway, which is more in line with the design signature. The bottom piece (the black plastic one we’ve already mentioned) connects with the interior metallic plastic creating interesting wave forms. But the interior is the shiniest part of the notebook whatsoever. ASUS used aluminum-like finish with metallic gray color and cool dot patterns around the top side of the keyboard. It feels really sturdy, it’s good to touch, but the palm rest area isn’t elevated. The keys are on the same level as the rest of the interior, they provide long tactile feedback, cool LED backlight, and the standard multimedia control buttons. Nonetheless, we would have been happier if the play/pause buttons and volume keys were placed closer to the function key. Users with smaller hands will find virtually impossible to reach those with one hand. This leaves us only with the touchpad, which is again great. It provides that strange “clicky” sound but registers all presses, swipes, and gestures accurately. It’s one of the best we’ve used so far, so there’s little room left for improvement when it comes to input devices. To wrap things up, we can say that the build quality, design, and overall feel are excellent. We can only say that the size of the machine are the only drawbacks here and we hope that ASUS has fixed that in the N552. Its profile and weight can easily be associated with a 17 incher, while we are presented with a 15-inch model. The ASUS N551VW uses the same panel as its gaming sibling – the GL552VW, so it inherits all the pros and cons from its brother. The panel used here is LG-made, LP156WF6-SPB5 model number, Full HD (1920×1080) resolution and 15.6-inch diagonal. This leads to a pixel density of 141 ppi and 0.18 x 0.18 pixel pitch. It can be considered “Retina” if viewed from a distance equal or greater than 61 cm. The display has excellent viewing angles as you can see from the image below. We measured the maximum brightness of the display – 311 cd/m2 with a maximum deviation of only 8%. Also, the color temperature (6600K) aligns almost perfectly to the optimal of 6500K and we observed no unacceptable deviations on the surface of the display. The yellow triangle represents the ability of ASUS GL552VW to cover the sRGB color gamut – 91% in this case. Below you can see the gamma curve that aligns with the 2.2 standard. X-Rite i1Display Pro was used for the calibration. We tested the display using 24 commonly used sample colors like skin tones, grass, blue sky, orange etc. After profiling the display had an average DeltaE 2000 deviation of only 0.72, while the contrast was 1100:1 before calibration and 1060:1 after. Pretty good results. Another representation of the colors we’ve tested. As we already mentioned above, the panel inherits the same pros and cons the GL552VW’s display has. While the N552VW provides spotless picture quality due to its high contrast ratio, brightness, color gamut coverage, and accurate tone response curve, the PWM is present from 0 to 99%. The good news is that the frequency of the emitted light is really high – 20.6 kHz and thus reducing the negative impact of one’s eyesight. We already stated our assessment of the screen quality – good contrast ratio, excellent viewing angles, wide sRGB color gamut coverage and high enough brightness. But the presence of the PWM (screen flickering) should be taken into account when buying this machine. The latter isn’t used only at 100% screen brightness. However, it’s better in most aspects than the last generation N551 with Samsung 156HL01-102 PLS panel. As we expected, the sound quality is excellent, especially when you add the external subwoofer into the mix. You can take a look at the graph below showing clear sounds, deep bass and frequency amplitudes of +/-6 dB. We can’t expect good battery readings due to the demanding hardware and pixel-packed IPS panel. However, the relatively big 56Wh battery proved us wrong. We got surprisingly good results in Wi-Fi browsing test, but didn’t quite meet our expectations when it comes to video playback time. They were conducted under the same conditions as always – Wi-Fi turned on, battery saver on, and screen brightness set to 120 cd/m2. Not bad result considering the hardware – 346 minutes (5 hours and 46 minutes). Unsatisfying result here and surprisingly lower than the Wi-Fi browsing test – 272 minutes (4 hours and 32 minutes). As expected, the gaming test took a toll on the battery with only 67 minutes (1 hour and 7 minutes) of play time. While this test doesn’t represent real-life usage, it’s a good way to assess the capabilities of the cooling system nad the overall stability of the machine. The test includes 100% CPU and 100% GPU load at the same time, but first things first. We start off with 100% CPU load for at least an hour, but since we already tested the cooling system, which doesn’t differ from the old G551 at all, we know that the results will be good. You can see on the image below that the maximum operating temperature was as high as 80 °C and far away from the Tj. max – 100 °C. 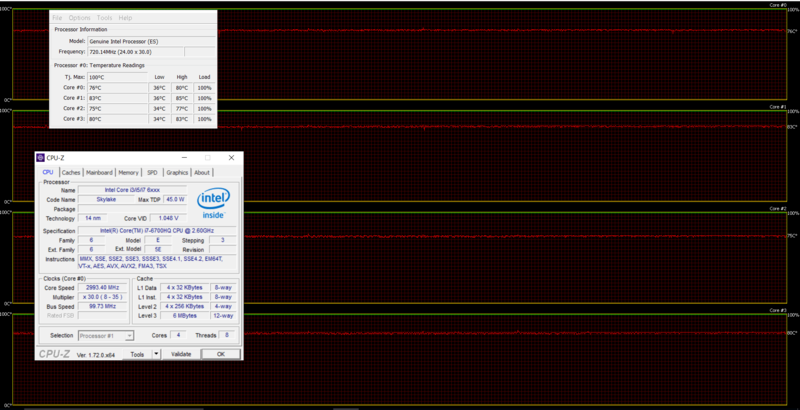 As for the frequency, the CPU was ticking at 3.1 GHz which is exactly the performance we expect from four active cores. After an hour had passed, we turned on the GPU torture test as well and, as a result, we saw only around 12 °C increase in silicon’s temperature and the GPU was running at 80 °C. 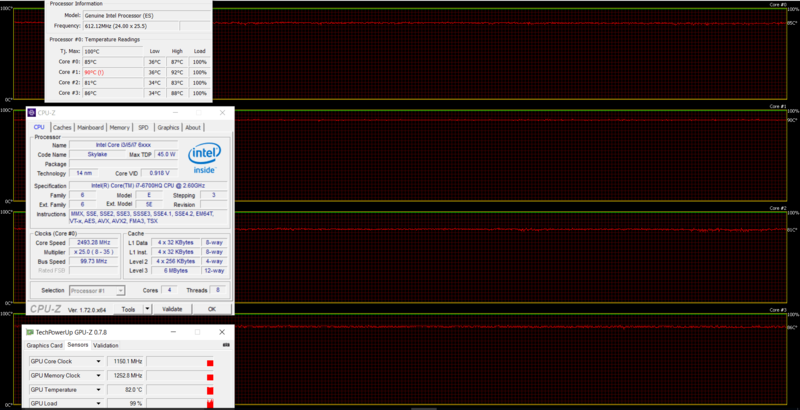 We saw some decreases in the operating frequency of the CPU from time to time, but nothing to worry about. The lowest point was around 2.5-2.6 GHz and this is the base frequency of the chip. We’ve also gathered data about the interior and as we expected, the cooling system did really well. There’s only a slight increase in temperatures near the spacebar and touchpad area, but you will not feel any discomfort at all. 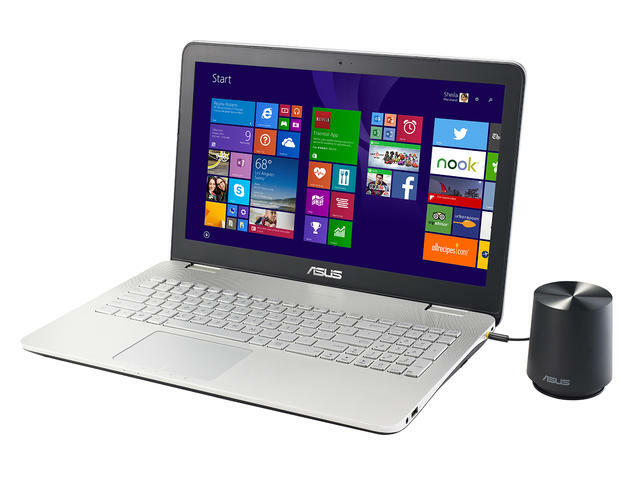 The refreshed ASUS N551NVW looks like a logical solution between the old N551 and the N552. It offers sleek design and good build quality with our only complaint being the big weight (2.7 kg) and thick profile (32.2 mm). We are also pretty pleased with the keyboard and touchpad performance. Both seem to be responsive accurate and comfortable. Good words come out for the picture quality of the IPS panel and the powerful hardware featuring 6th generation Intel Core i7 CPU, GTX 960M GPU, and, 8GB DDR4 RAM. We do have to mention, though, the use of PWM (pulse-width modulation) from 0 to 99% screen brightness. The good news is that the frequency of the emitted light is 20.6 kHz, which reduces the negative effect on the eyesight. When we add the good loudspeakers and external subwoofer into the mix, the notebook becomes perfect for multimedia content on the go. The bottom line is that the ASUS N551VW has a great value and the only things missing are the USB Type-C connector and M.2 SSD slot, but since those two will come with the N552, which will most probably cost a few hundred more, it’s normal that the notebook keeps the old mSATA SSD slot. It also serves as a great alternative to the GL552VW if you are willing to trade better build quality for USB 3.1 and M.2 SSD slot. Great!, guys. Keep going this way. You’re becoming easily one of the best testing sites out there. Is this model throtle GPU over 82 °C like G551? what would you recommed buying for video editing and games ? the N551VW or ROG GL552VW ? Yesss this was exactly the review which i wanted to see after days thank you so much. The “End” key on the keyboard is actually the switch on button (right upper corner). Does one has to switch off the “Num LK” key to enable you to use the “End” key? It’s the same horrible placement since the first N551 in 2015. Be ready to shut down the laptop while browsing the web or viewing a file. Just bought the new laptop (N551VW). The issue I encountered is likely related to a side-effect of CPU throttling. Each time the clock speed changes up or down, I do hear a momentary audio glitch. It is a bit annoying. I just planned to buy such notebook. Which circumstances caused audio glitch? Is it heard from speakers? Actually, I was wrong. The audio glitch is definitely not caused by CPU throttling. It looks like the audio cards is being turned off when it is not in use. So every time before and after playing a sound the glitch appears. Although the glitch sound is barely noticeable, in the begging it annoyed a lot, but now I got used to it. Most of the time I use “work around” – play muted audio in the background to keep the sound card alive and prevent these glitches. I do confirm that the power supply provides 19V and 6.32A of current. Hi thanks for confirming that for me. One other question! Is this laptop bluetooth enabled? Some retail sites list it as no bluetooth. Seems strange it would not have a bluetooth adaptor?? I am not sure for other, but my build (N551VW-FY204T) has Intel® Dual Band Wireless-AC 7265 adapter which includes Bluetooth 4.0. Many thanks for your answers. Very helpful. i have same problem with this sounds that heard on top right of keyboard !!! This mean if I be use this laptop on the 100% brightness won’t be PWM? Can you replace the battery, I know some laptops (ie Surface) can’t be replaced. Every laptop I’ve had needed a new battery after a couple of years. Try using the arrow keys and the keyboard in general to install the OS. After you’ve installed it, I’m sure your touchpad will work fine. We’ve encountered several cases where touchpads on ASUS laptops don’t work during the installation. I own an Asus N551VW and I am trying to upgrade it to 32GB RAM. Has anyone here actually upgraded an Asus N551VW to 32GB RAM? Some of the reviews suggest that this is possible, but I don’t want to purchase 2x16GB RAM sticks unless someone confirms this claim.